For today's Tasty Tuesday, the Ladies from Envy My Cooking are here to share a delicious cake recipe. Welcome Jenny and Karla! We're Jenny & Karla, and we are both stay at home moms with two children each. Our girls are both 2 and both our boys are about a year old....very fun. We have a blog called Envy My Cooking, where readers submit their recipes to share! Come visit us, and find something yummy to share with your family! -Whisk the eggs with the pudding mix. -Pour into sprayed bunt pan and bake at 325 for 45 min. -Cool about 10 min and remove onto a rack to cool completely. 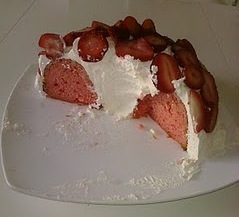 -Mix all the ingredients except cool whip withelectric mixer until smooth. -Fold in cool whip into filling. 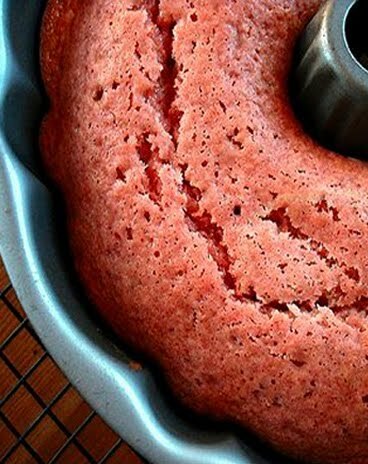 -Spreadover the cake evenly and garnish with fresh strawberries. Note: If you do not own a bunt pan you can use two 9" pans and cookfor 30 minutes. Thanks so much for sharing your recipe with us today ladies! Everyone, go give Envy My Cooking some love and check out all their other yummy recipes. They have recipes for main dishes, side dishes, and desserts. Wow, looks and sounds yummy! Thanks for sharing! Yum! I love cooking and I love both your blogs! This looks so yummy! I am going to check out their blogs. You always have the best recipes! This one looks delicious! That looks delicious!! Yummy!! Thanks for sharing! This cake looks DELICIOUS!!! I will have to try it! It still feels like summer here so this looks refreshing!